Electric Fencing Supplies is a one stop online electric fencing shop started to make it easy for famers to find a full range of quality electric fencing products online. Available from Electric Fencing Supplies, the Speedrite Unigizer is the next generation of energiser for smaller electric fence systems. Customers have a choice of six different models, the Speedrite 500, 1000, 2000, 3000, 6000i and 12000i, each of which can handle electric fence applications up to 80 hectares, or 120km of multi-wire fence line. The 6000i and 12000i Speedrite Unigizers are remote control compatible, allowing even more flexibility from an electric fence energizer. Thanks to it's next generation technology, the Speedrite Unigizer electric fence energiser can be used as a mains powered unit or as battery a energizer, resulting in more flexibility with less fuss. 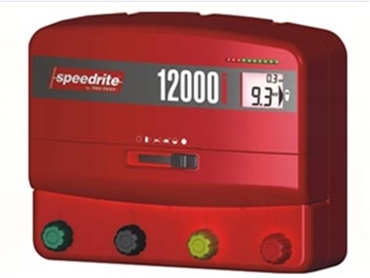 When connected to mains power, the Speedrite Unigizer is ideal for protecting farm buildings, hay or silage stores, as well as electrifying stockyards and small electric fences where mains supply is available. When connected to a 12 volt battery, these energisers transform to provide electric power to remote locations where instant electric protection is required. The new Speedrite Unigizer models are solar panel compatible and have been designed with reliable electric fencing in mind. All purpose Speedrite Unigizers are the first electric fence energiser to use a unique switch mechanism to control it's functions. This results in no more mechanical switches connecting through the case where water and other contaminants can damage sensitive electronic components.